In addition to providing a monetary discount at checkout with the Incentivized purchase module, you can get customers excited about your brand by offering additional types of reward, using Antavo’s Rewards module. Your rewards offering will be visible in the Loyalty Hub, where customers can claim rewards in exchange for their loyalty points. By offering a wide range of reward types, you can keep up with customer expectations and make loyalty members feel they’re part of an amazing program. You can find the configuration page of the Rewards module by clicking on the ‘Modules’ link in the top menu bar and then selecting ‘Purchase driven modules’ from the list on the left-hand side. You’ll first find the list of rewards that you’ve already set up. Warning!Antavo does not take part in the actual delivery of physical rewards. We can, however, provide download links to virtual goods on the Thank you pages and include the uploaded coupon codes in the reward claim notifications. In the first three sections, you can define all the required information and the method for reward redemption. All of this info will be visible to program members on the reward cards and reward pages under the ‘Redeem points’ tab of the Loyalty Hub. You can upload multiple pictures of your rewards, that will appear on the Rewards page as a reward gallery. Read more about reward categories here. Before setting reward categories, please consult your Implementation Consultant. If you want to use a previously created custom thank you page, you can select it from the dropdown list. Please learn more about the thank you pages below. The reward will appear on the Loyalty Hub on this date. The reward will disappear from the Loyalty Hub on this date. You can choose to make the reward redeemable for specific customer segments only. Tick the box if you want to hide the reward card from customers who are not in your selected segments. Learn more about segmentation here. If you do not hide the reward, the card will still be visible on the Loyalty Hub for customers outside of the selected segment(s), but the redemption option will be locked. This text will appear on the locked card, explaining why the customer is unable to redeem the reward. In case you have a limited number of rewards, select the radio button then enter the number of rewards available. Use our Multilanguage module to translate all text in the loyalty program to each language you choose, by clicking on the ‘Translate’ button next to the text fields. If you don’t specify custom texts, the base text will be applied to all languages. Except for physical items and custom rewards, each reward type has type-specific settings in the last section of the reward editor. Upload the file you want to offer as a reward. You can learn more about how to upload coupon codes here. When 90% of the coupons have been claimed, our system sends a notification to admin users that your coupons are running low. If you need us to serve your endpoint with the pattern, you can define it here. Expiration time: You can also set an expiration period for the coupon codes by entering the period. Please keep in mind that Antavo doesn’t handle coupon expiration! This time only serves to inform customers, and will be included in the reward claim notification email. Coupon type and value: Decide whether you want to offer a percentage-off coupon or a fixed amount discount and set the specific value. Please note that this information only serves administrative purposes on the Loyalty Management Platform. It will not influence the value of the coupon code at checkout. Upload the badge image you want to offer as a reward. The minimum bid value will be raised by this amount with every bid. Tick the box if you want only the highest bidding customer’s points to be deducted, otherwise all bids will be deducted from customers’ point balances immediately after they make their bids. Once you have entered all the information required for the reward, save your settings using the ‘Save’ button at the bottom of the setup page. First the reward will be saved as ‘inactive’, which means the reward will not appear in the Loyalty Hub and will appear only in the list of rewards in the Rewards module configuration page. After you have saved your new reward, you can activate it right away using the ‘Set active’ button on the upper right-hand side of the reward setup page and confirm the activation in the dialog that subsequently appears. Important!In the case of Coupon type rewards, please don’t forget to upload coupons using the Upload option before activating the reward. If you don’t want to activate the reward right after saving, you can always find the activation button on the reward editor page. 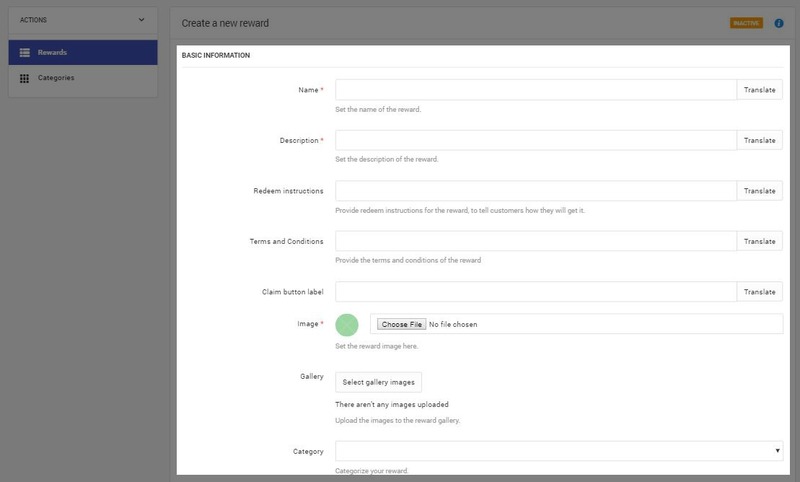 You have the option to delete inactive rewards from the Loyalty Management Platform by archiving it. Warning! Archivation is irreversible. Once a reward is archived, it cannot be restored anymore. By default categories serve only for informative purposes on the Loyalty Management Platform. However, if you want to organize your rewards into categories on the customer-facing Loyalty Hub as well, please consult your Onboarding manager. If you want to use a previously created custom thank you page as the default thank you page for the rewards in a specific category, you can select it from the dropdown list. Learn more about the thank you pages below. Please note that the thank you page set under a specific reward will overwrite the default category thank you page. You can choose to make the reward in the category redeemable for specific customer segments only. Tick the box if you want to hide the reward category card from customers who are not in your selected segments. Learn more about segmentation here. If you do not hide the reward category, the card will still be visible on the Loyalty Hub for customers outside of the selected segment(s), but the redemption option will be locked. This text will appear on the locked card, explaining why the customer is unable to redeem rewards in this category. You may set up as many categories as you wish, but only the categories which contain at least one reward will be visible to customers. If you have the Multilanguage module turned on, use the ‘Translate’ button to add translations in the dialog that appears. Use the ‘Edit’ buttons on the ‘Categories’ page to edit your categories. A category can be deleted by clicking on the ‘Delete’ button on the upper lefthand side of the reward category editor page. To help you manage the delivery of physical rewards, we provide a reward checklist on the Rewards module page. 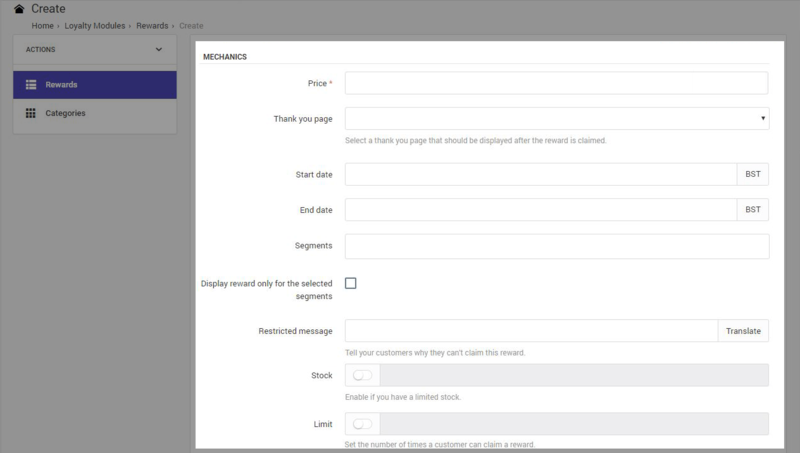 If a customer claims a physical item, a notification will appear on the page, indicating that you have a reward to handle. You can reach the list by using the ‘Click here to view them’ link on the Reward module configuration page. After you’ve ensured that the reward is delivered to your customer, just click on the ‘Accept’ button next to the claim and it will disappear from the list. Please note that this action cannot be undone, so please be cautious when you check the box. 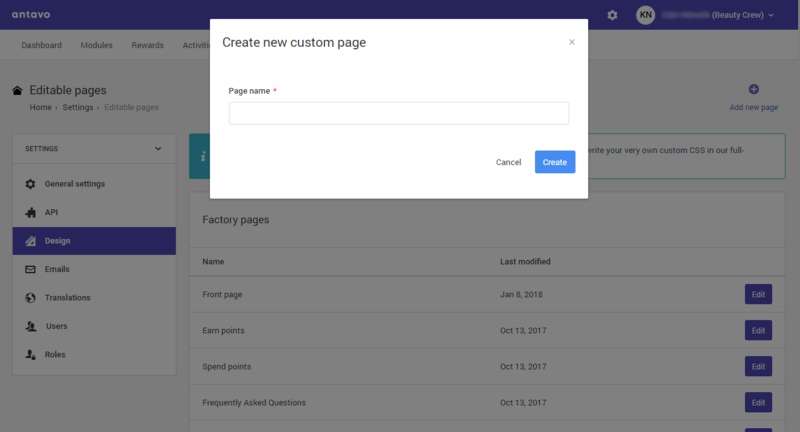 Filter your rewards on the Loyalty Platform by clicking on the ‘Filters’ button at the top of the module configuration page, next to the ‘Create’ button. There are three options: filter rewards by status, type or both. Just click ‘Apply’ to see the filtered list, or ‘Reset’ to choose a new filtering method. You can define the order of the reward cards on the ‘Redeem points’ of the Loyalty Hub by selecting the ‘Sorting’ option on the module configuration page. Just drag and drop the reward to change the order. Your changes will be reflected on the Loyalty Hub right away. If your rewards are categorized on the Loyalty Hub, please consult your Onboarding manager about this function. Use the search bar to search for a specific reward’s name in the reward list on the Rewards module page. View the full list of claims by navigating to a specific reward’s Statistics or Edit page, then to the ‘Claims’ tab on the left-hand side of the page. In case of a bidding reward, you’ll find a ‘Bids’ tab. In addition to overall reward statistics found on the Dashboard, you can view detailed reports on how your rewards are performing individually. 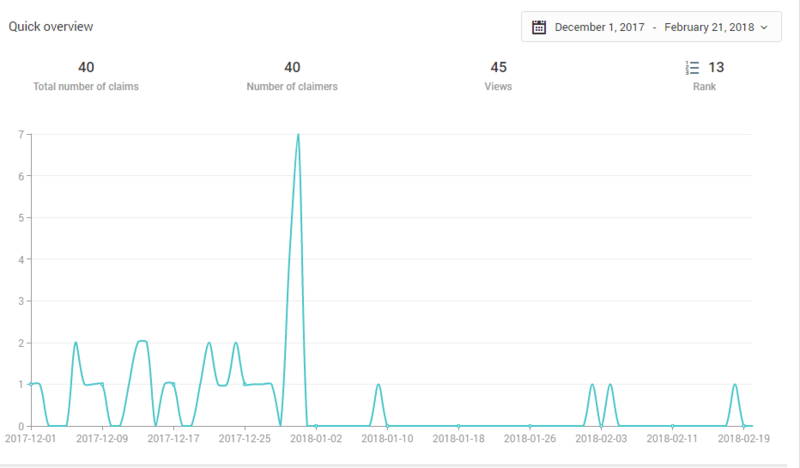 To reach the Statistics page for a particular reward, go the the Rewards module configuration page and select the ‘Statistics’ option from the hamburger button for the relevant reward. After customers redeem rewards on the Spend points page of the Loyalty Hub, they are redirected to the default Thank you page that provides further information about how they can retrieve their rewards. As soon as the custom page has been created, you will be able to find it as a selectable thank you page in the dropdown list under the Thank you page section of the Reward editor, the Reward Category editor, and in the Custom pages list on the Design page, where you can edit it anytime. Please note that your changes will go live immediately after clicking the ‘Save’ button in the editor. 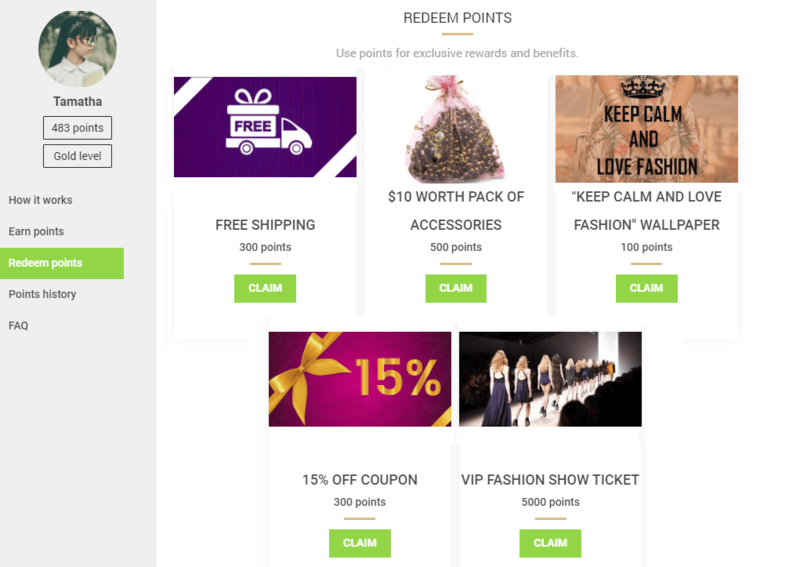 Send a reward claim email to your customers after they’ve redeemed their points for a reward. To enable the claim notification for a reward, you need to enable notifications in the reward editor. Send yourself a test email to see how the email will look from a program member’s perspective. To do so, click the hamburger button on the ‘Emails’ page and select the ‘Test send’ option. If you have created a Coupon type of reward with the ‘Upload’ option at the coupon source setting, you will need to upload the coupons before activating the reward. Click on the ‘Upload’ button in the upper right-hand side of the Coupons tab. Right after the upload, coupons will appear in the list with a ‘Not claimed yet’ label. View the list of coupon codes issued to customers by navigating to a coupon reward’s Statistics or Edit page, then to the ‘Coupons’ tab on the left-hand side of the page. If you want to remove coupons so that they are not issued to customers, you will need to invalidate the coupon. Please note, that you can invalidate coupons code until they’re not claimed yet. Jot down a list of possible rewards you can offer. Consider what kinds of rewards your customers might expect from you. Think about rewards that your customers can buy in your store anyway and exclusive specialities like VIP events, personalized goods, workshops and limited edition items. Exclusive rewards are usually more expensive, but they can create a strong emotional bond between you and your customer, which is the driving force for brand loyalty. Don’t neglect logistics when planning your rewards. Antavo can notify customers that they redeemed a reward with the ‘Reward claim’ email, but your team must take care of shipping and delivery. Offer the most valuable rewards to your most valuable customers. Locking rewards to specific customer segments, while still making them visible to all members, can encourage shoppers at a lower tier (or membership level) to work towards entering higher tiers, in order to get access to exclusive rewards.